Almost everyone would agree that the real joy of growing your very own plants in your garden comes when you can actually see the fruits of your labor. It takes time and a lot of work to make your garden reach its peak. It is not an easy process that leads to you seeing flowers bloom on your plants, and it’s only natural that once you have successfully led your garden to that point, with flowers of all colors and shapes a living testament of your hard work, you would want to keep it like that forever. Alas, that is not possible. There comes a point when you will have to see those flowers being blown away by a strong gust of wind, or getting scorched by too much sunlight. It is inevitable, and it is not an easy thing to watch. So why not cut those flowers and use them somewhere while you can? A lot of people have a negative reaction to this suggestion. But they need to understand that once their flowers reach their peak, it is the precise time to cut them and arrange them into a beautiful bouquet that can be enjoyed every day sitting on their living room’s windowsill or in a loved one’s house. As mentioned before, one reason to cut flowers is to save them from getting destroyed by an unseen change in the weather. Cutting them ensures that some of them are safe and can be enjoyed for a longer period of time. The second reason is that cutting encourages further growth. It promotes the growth of more blooms before the fruits start coming, so you can have more flowers in no time. The last reason to cut your beautiful blooms is so that you can enjoy them every day. Creating a bouquet out of your hard work gives you a sense of achievement and encourages you to take care of your flowers. You don’t have to cut all your flowers at once though; you can add foliage to the arrangements to fill them up. Sometimes it’s the small things that can make the difference. In the case of cutting flowers, it’s the time when you cut. Cutting your flowers in the early morning is the best you can do. The reason is that flowers have been exposed to the cool night air and morning dew, which makes their stems full of water and carbs. Cutting flowers later in the day means that the flowers have started to lose their moisture and are becoming limp as the day progresses. When such flowers are separated from their parent plant, you cannot always be sure that they will react positively to it. This may lead to a shorter vase life. When cutting, be sure to have a bucket of water ready next to you. Place your flowers in this water immediately to keep them healthy. Otherwise, they will die in no time. There is a right tool for everything, and cutting flowers is no different. Tools that are made to cut flowers should be used. They should be clean and sharp, so that the separation of the flower from the plant is quick and the vessels used for water transfer are kept intact. Many people don’t realize this and use kitchen knives, which are usually blunt and not sharp enough. 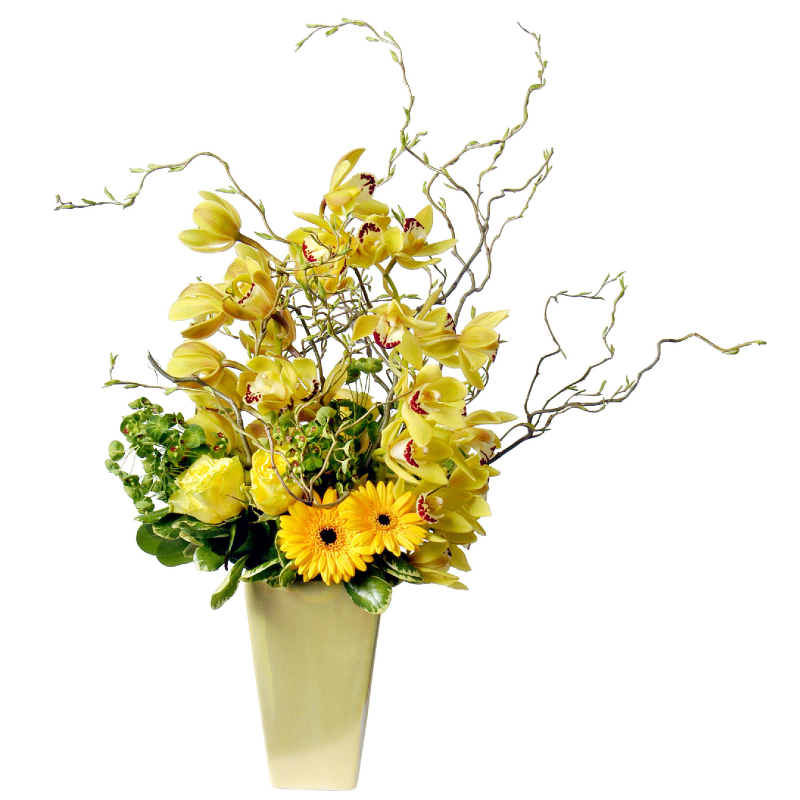 This causes the vascular system of the stems to be crushed, causing a lack of water transfer once in the vase. 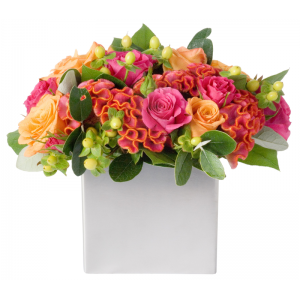 The fundamental thing that needs to be kept in mind when caring for cut flowers is that you need to make sure that water and nutrients get to the top of the flower as quick as possible. Warm water works better in this case, as the molecules move faster than in cold water. The ideal temperature of water is 100-110 degrees Fahrenheit. Something to keep in mind is that there are bulb flowers, like tulip, which need cold water to live. These will not survive in warm water. While attached to a plant, the flowers get all their nutrition from it. But once cut away, they have nowhere to get their essential nutrients from. There are three things that flowers need. • Carbohydrates are needed for cell metabolism. • Biocides are required to keep the flower healthy by fighting off bacteria. • Acidifiers are needed to keep the pH of the water in check. The best alternative to these nutrients is to use a preservative. Preservatives for cut flowers have sugar that gives nutrition, bleach that acts as a biocide, and citric acid to acidify the water to the flower’s need. • Make sure that your vase is not overcrowded with flowers. Give each flower some breathing room. • Keep an eye on the water level in the vase. Change the water frequently. • If you notice a flower going limp, it means that it’s not getting enough water. Recut it at an angle of 45 degrees to ensure maximum surface area to capture water. • Keep your vase away from direct sunlight and drafts. Following these steps, you can be sure that your flowers remain fresh and healthy even after being cut away from their plants. There is nothing that should hold you back from cutting your flowers after going through this guide, and we hope our readers learned something new about caring for their cut flowers. Nature is beautiful. It is a perfectly ordered system that makes human life possible. The beauty of nature is unmatched by human inventions and design, no matter how much we advance in our lives. That is why human beings turn to natural solutions when their artificial ways fail. We try to make our buildings and our spaces beautiful, but we forget to incorporate nature into them. And when we realize that our indoor spaces have become bland and boring, all we can do is introduce some natural elements to brighten them up again. This is where plants come in. These are a symbol of natural beauty and elegance that we humans can only marvel at. Many people love to grow plants inside their homes, and one of the primary intentions while doing so is to add color in the home. While there are many plants that can be grown indoors to add color and life, the Duranta plant is one of the most attractive. The Duranta plant (Duranta erecta) is naturally found in the American tropics. More than 30 species of the plant are native to this region. This evergreen plant belongs to the Verbena family, and grows from 2 to 15 feet tall. The Duranta is a flowering plant, which produces flowers all year round, except during heavy frost. The plant resembles a shrub and its branches droop down a little. The flowers are like orchids of light blue to light purple colors, and attract butterflies and birds when the Duranta is planted outside. This way, one single plant can bring a whole lot of nature to your backyard thanks to its height and the clumps of beautiful flowers. 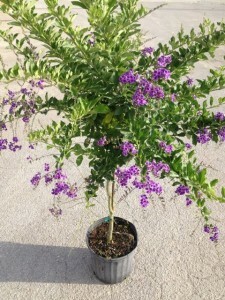 You’re in luck if you are in an area where the Duranta is an annual plant because you can easily grow it in a large container and keep it outside. You would only have to bring it inside when the weather gets chilly, and placing it in front of a south-facing window will help it stay healthy and colorful throughout the winter. Duranta plants prefer sunny environments. They like plenty of light to grow to their full potential. If placed outside, they should be placed in the full sun. The plant can be grown in partial sun as well as in dry areas. This, however, causes its growth to be affected in a negative way. When placed inside, you can keep it in front of a south-facing window that lets in plenty of light. Placing it in front of a south-east or south-west window without curtains would work better in case you want to control the height from getting too much for an indoor space. Use a balanced fertilizer four times throughout the growing season. Feed it starting in early spring and continue to fertilize till late fall. This will ensure that the Duranta grows healthy and displays its flowering prowess to the fullest. A newly planted Duranta needs to be watered weekly, or when the soil dries out. Once the plant turns into an established adult, you need to water it only when an extended period of dry weather hits. A rich and organic soil, which drains well, is best suited to grow the Duranta plant. Soil that does not drain well is a major cause of root rot in many plants, and it is a risk no one should knowingly take. In order to propagate your Duranta, you need to use a hardwood cutting. Hardwood cuttings should preferably be taken during early spring or early winter. The reason for doing this is to incur as little damage to the parent plant as possible. • After you have a hardwood cutting, trim it at a point where a leaf bud would grow. • Leave at least two buds above the one at the bottom, and cut the top of the cutting. • Strip off the leaf buds at the bottom, and take off the bark about two inches on top of this. • Dip this end of the cutting into a rooting hormone and then place it into damp soilless mix. • Cover the pot with plastic, making sure that the plastic does not touch the cutting itself but still covers the whole thing. • Place this in indirect sunlight so it stays warm. • Keep checking the pot for root development. You can remove the plastic and start treating it like an adult once the roots have developed. This plant generally resists a lot of diseases. It can, however, be infested by pests such as scales, mealy bugs, and nematodes. In case of a scale infestation, use a horticultural oil to spray the plant with. Mealy bugs are easy to spot, thanks to the cottony masses they grow as, and can easily be gotten rid of by spraying the plant with water from a gardening hose. One thing to note is that the leaves and berries of this plant are poisonous to humans. So if you have young children in your house, you would want to be careful of that. The plant, if taken care of, will live for about 15 years and give you beautiful and fragrant flowers that add both a visual as well as an olfactory quality to your home. If you are looking for a plant that speaks of nature through and through, from its beautiful colors to the fragrance of its flowers, the Duranta plant is a worthy contender. When you take into account all the people who want to have plants in their homes, and those that are actually willing to take care of them and give time to them, you will realize that the latter numbers aren’t very high. While people do love to have some green in their artificial homes, they might not always have the time or expertise to take care of their indoor plants. The ZZ plant is a dream come true for those people. This is a plant that requires virtually nothing from you to stay healthy. This plant can take months of neglect and still manage to look amazing. This quality of it is the reason that up until some years ago, people saw this plant as an artificial addition in malls and public places. A plant that looks fresh throughout the year must have seemed too good to be true. 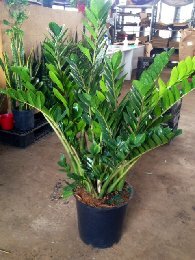 The common name ‘ZZ’ of the plant is a short form of its scientific name, Zamioculcas Zamiifolia. The plant started to be grown in masses for the first time in the 1990’s by the Dutch, and has slowly gained its popularity to be a part of indoor spaces. One slight disadvantage with the plant is that you can find only one cultivar to grow. This is the all green variety, also known as the Eternity Plant. The plant’s stems look almost like a wand, being thick at the base and tapering slowly to a point as they move up. What makes people confuse this for an artificial plant is its leaves, which are oval shaped and have a waxy coating on them. This coating makes people think it is an arrangement sculpted out of plastic. The height of the plant can be up to 24 inches. Its spread is determined by the size of the pot it is in. A wider pot will lead to a more bushy plant. The ZZ plant care requirements are extremely easy. The plant does not need a lot of attention, and is sure to add a touch of freshness to your home after minimal effort on your part. 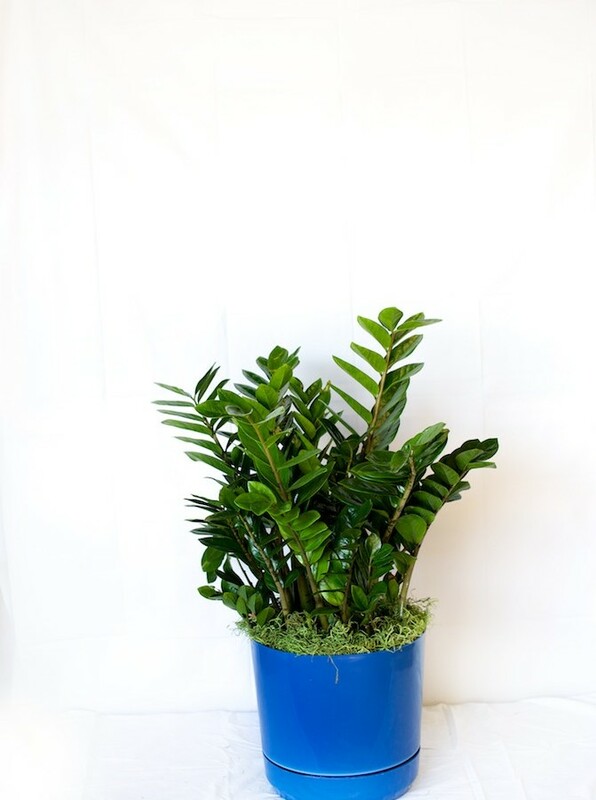 The ZZ plant can thrive in a variety of lighting conditions. The only kind of light it doesn’t like is that which is too harsh and direct. This will cause scalding on the leaves, and can lead to curling and yellowing as well. Bright and moderate, but indirect, light is more suited to their survival. However, they do just fine in extremely low light as well, such as that in a bathroom or in a windowless space. The ZZ plant does not require a lot of watering either. On top of that, the only thing you need to be careful of is to not over water the plant. This has known to cause many ZZ plants to die. Watering can be done when the soil goes completely dry. The soil does need to be moist for the most part of warmer seasons to ensure high levels of growth. The ZZ plant can survive in most temperatures. The ideal temperature range is between 13 – 26 degrees Celsius. Warmer temperatures will lead to more growth. As with water and light, the plant doesn’t require fertilizer either. If the plant is not growing, you do not need to feed it. When it is growing, a weak fertilizer once a month will be enough. If one ZZ plant isn’t enough for you and you want to grow more, the process of propagating is fairly simple. However, you should know that you are looking at a wait of up to a year before you start seeing a new plant emerging. • Take off a leaf from the plant gently, and allow its raw edge to dry out. • Take a pot and fill it up with a free draining compost mix. • Place the leaf into this mix, with the raw edge inside. The edge needs to be inside only to hold the leaf in place, so a few centimeters under the soil will do. • You will see a new stem coming out of the soil next to the leaf you planted. This means that a new plant has started to grow. • You will notice that the leaf has died suddenly. If this happens, pull out the leaf carefully. If there are some small tubers on the raw edge of it, then you can place it back into the mix and hope that the tubers lead to a new plant. • You will notice the leaf dying, and upon pulling it out there is nothing else to see other than the dead leaf. This means that you attempt has failed, and you should try again. The ZZ plant offers a unique solution to those people who want an attractive, easy-to-grow plant in their homes with the absolute minimal care. The best way to keep this plant alive and healthy is just to forget about it. It requires very little in terms of attention and care, and the best thing you can do for the ZZ plant’s survival and well being is to basically do nothing at all. Just place it somewhere with a good amount of light, water it every once in a while, and it will reward you with a fresh and green focal point in your indoor space. The use of plants inside homes is becoming more and more common, as more contemporary house designs incorporate these natural elements in the interiors to add a layer of freshness. There are many plants that are being used for the purpose, and many of these are the ones that create a certain focal point in an indoor space. One such plant is the Yucca Cane, which has a thin, slender stem on which long and pointed narrow leaves grow. This creates a point of focus and interest in any indoor space, and is a great way of using something natural to brighten up your home. The Yucca plant belongs to the lily family and is originated from southern Mexico. There are more than 20 species of the plant that exist in the world today. Based on what variety it is, its coloration can be anywhere from green to bluish. The leaves of the plant are variegated in cream, yellow, and white colors as well. Yucca plant care is fairly simple. All you need to do is put it in the right location and the plant will thrive. Most of the yucca plants grown indoors are kept in 10, 14, or 17-inch pots. It is very rare to see a pot larger than this. The plants usually grow to a height of 3 to 8 feet, while plants as high as 15 feet are seen as well. So you may need to be careful of where you keep your plant, as sunlight plays a large role in its growth. The Yucca cane requires a good amount of sunlight to grow well. While the plants will grow well in direct sunlight, the tips of their leaves will be discolored. Therefore, it is wise to keep them in a bright but slightly shaded area for better colorization. It has also been seen that a yucca kept in brighter sunlight grows faster, so it may be strategic to keep it in a shady area so you don’t run out of room for it soon, given its height. The yucca cane can handle most temperature variations, which makes it a good choice for an indoor plant. However, it is a good idea to grow it in movable containers as the plant cannot handle frost. This allows you to bring the plant inside during extreme winters. You can then take the plant back outside in spring and summer, placing it in an area where the gentle morning sun shines on it. The Yucca cane does not need to be watered too often, being somewhat drought resistant as well. However, when you water the plant, it is important to let the top of the soil almost dry out before watering again. More importantly, do not leave your plant sitting in a puddle of water. This extra water will become the cause of root rot if the sun isn’t bright enough to evaporate it in time. The result will be a plant with collapsed foliage. Fertilization is not necessary to have a fully grown yucca cane. However, it can help make the process a little faster. The most important aspect of the soil holding the Yucca cane is that it should be strong enough to carry its vertical weight. The soil should also have good drainage, and be able to retain some water as well. A good medium to help grow the Yucca is three parts sand with one part peat. Lucky for you, spider mites do not like the Yucca plant. The plant is generally free from pests but can be seen infested sometimes with scale or mealybugs. If this happens, use a light insecticide or just a fast stream of water to wash the insects off. One common issue that arises with Yucca is the growth of a fungus that many people think to be scale. The owners of the plant may use pesticides to kill the ‘scale’ only to see it not working. The best way to be sure is to try and ‘flick’ this black substance off of the plant. If it is scale, it will come off with a flick and you can then use pesticide. If however, it is not scale, you should remove the infected leaves so that the origin of the fungus is removed altogether and it cannot grow anymore. The yucca plant has some offsets, known as pups, which can be used to get more plants. To do that, you will need to remove the plant from its container. This step is preferred to be done outdoors. The next step is to remove the pup with a clean cut. This pup can now be potted separately, and a rooting compound can be added to its soil. The adult plant will start appearing after some time. Like with a grown yucca, fertilization here is not necessary but can be helpful in having the plant grow better roots. So there you have it. 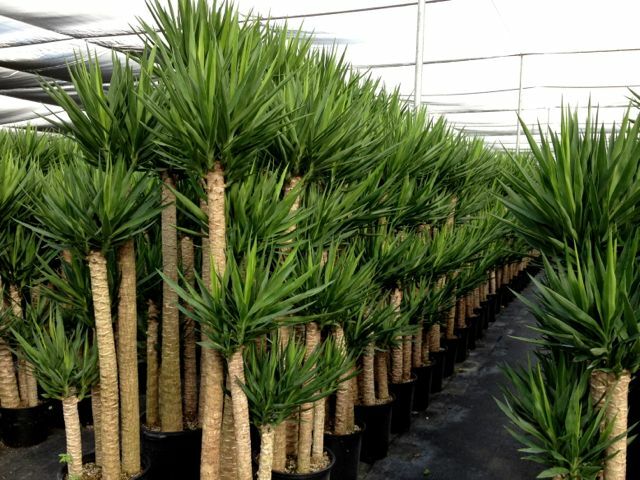 If you want a houseplant that looks different, with a bold form, and is high enough to create a statement in your room or your lounge, then the yucca cane is your answer. Growing one isn’t very hard, as it doesn’t need to fed or watered very frequently, and basically grows on its own. The only thing you really need to be careful of is how much light the plant is getting, and you can be sure that this plant will become a focal point and a piece of natural beauty in your home. Plants add beauty to living spaces and make them more attractive. They help introduce color and life, and induce a sense of serenity. The ponytail palm, also known as the elephant foot tree or the bottle palm tree, is one of the classier choices for your home, office, garden or porch. Its firm ball-like trunk and long green leaves make it magnificent to look at. In spite of its name, the ponytail palm is not a palm. Its scientific name is beaucarnea recurvata. A southeast Mexican native, the ponytail palm is related closer to the Lily family than the Palm. The long leathery stems grow as the plants ages, up to three feet in height when planted indoors. While it is easy to grow the ponytail palm, it is difficult to get accustomed to its watering need as over-watering can cause stem rot. The ponytail palm belongs to the beaucarnea recurvata family. It is a perennial plant that has over 10 different species. They are available in a variety of different shades of green. From mint green to dark green, there is a ponytail palm suited for all kinds of gardens and room settings. Common variations include Beaucarnea stricta, Beaucarnea gracilis and Beaucarnea guatamalensis. The ponytail palm loves the sun and should be placed in such a position that it receives maximum sunlight. The bulbous trunk and waxy leaves tell that the plant is good at retaining water, so watering is not required very frequently. The plant should be watered every seven to fourteen days in the growing season. It should, however, be ensured that the soil is well drained. On the other hand, you can get away without watering for up to two months easily. The bulb at the base stores water which the plant consumes when it needs to. Ponytails prefer temperatures above 60 degrees F but can survive as low as 50. Fertilization may be done one to two times a year for healthy green leaves. When potting a ponytail palm, use dry soil and let the plant take root before watering it. As mentioned earlier ponytail palm stays happy in semi-arid condition, and too much water may lead to stunted growth and brown leaves. Over-watering will result in the leaves growing brown while scarce watering will have very little negative impact on the plant’s health. Cactus soil can also be used for a ponytail palm. It is best to let the soil dry out completely between two waterings to allow for the best possible growth of the plant. It can take a heavy amount of water as long as the soil is well drained. In warmer parts of the country where the temperatures do not fall below 50 degrees Fahrenheit, he plant may be left outside in all weathers as it is resistant to both extremities of temperature. The ponytail prefers cooler temperatures in the winter. However, if winter temperatures plunge below 50 degrees, it is better to keep the plant indoors for the season. 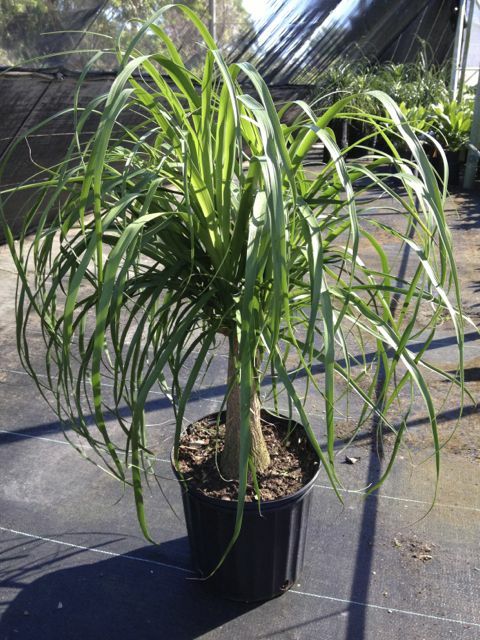 The ponytail palm is drought-resistant so it can be left outside even in the hottest of days without any need to worry. The plant can grow up to 15 feet tall outdoors so it should be planted keeping this in mind. Once the plant has grown big enough it will become harder to repot. Along with maximum sun exposure, make sure that the palm is placed in a garden where water does not accumulate as it will lead to root rot. Repotting the ponytail will not be required very frequently as it grows slowly. Care should be taken to choose a pot that is no more than two to three inches bigger in diameter than the previous pot. A much larger pot will soak up a greater amount of water which can be harmful for the plant. It is advised not to fertilize the soil before four weeks of potting, as the slack soil will make the roots take up too much fertilizer and cause them to burn. Ideal soil pH requirement is between 6.5 and 7.5. The plant should never be trimmed from the top. The ponytail palm is slow growing but can last for centuries and reach in height up to thirty feet. It is considered as one of the easiest indoor growing plants and with very little care, the ponytail palm will add elegance and sophistication to your room, garden or porch. The ponytail palm is happy to be a single stem plant. However, cuts and bruises often result in growth of multiple stems. It is also quite common for larger specimen to grow flowers at the top. The flowers are often considered a disproportionate feature and are trimmed. Injury to the base of the plant will increase likelihood of rot to the affected area. The ponytail palm is one the easier plants to maintain and keep at your home. The plant’s requirements vary according to different climates. Plants kept indoor in pots require a little more maintenance than the bigger plants kept outside. Young ponytail plants require special attention as they are more prone to disease. Once they have grown big enough, they become sufficiently strong to fend for themselves. Outdoor plants are only susceptible to frost, but the bigger ones usually easily make it through a harsh winter. Ponytail palms have been known to live for as much as three hundred and fifty years. This versatile plant looks simple yet classy and is easy to maintain, which is why it is one of the number one choices for an indoor plant. It makes for a great gift for a colleague or friend. With the right care it will transform any living space from dull to fabulous and exciting.